If you're just getting started with sewing, it's important to buy a machine that's reliable, easy to use, and reasonably priced. Don't get overwhelmed by all the models on the market. The following options have the perfect combination of price and features for a beginner. 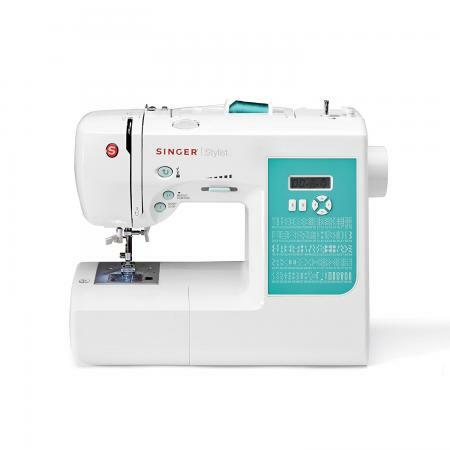 Twice awarded the Consumer's Digest Best Buy ranking, the Singer 7258 Stylist is a machine that will take you from beginner projects to more advanced patterns with ease. 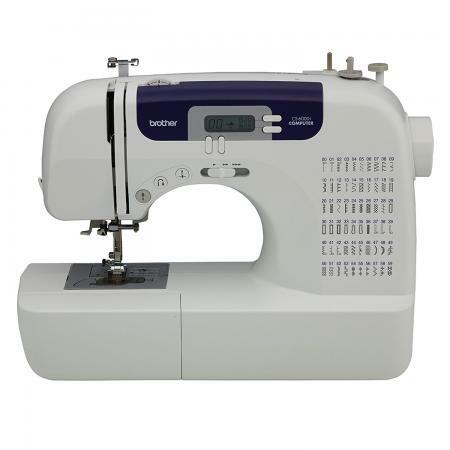 With 100 built-in stitches and seven different automatic button hole options, this machine can do the basics and much more. It can even work for basic quilting, and a 25-year warranty from Singer has you covered. It comes with 10 different presser feet and retails for about $200. Variable speed control lets you sew as slowly as you want in those tricky areas or up to 750 stitches per minute when you're ready to fly. You can even control speed with a button instead of the foot pedal if that's easier for you. You can easily thread the Singer 7258 by following the arrows posted on the machine. In fact, Singer boasts you can thread it in six seconds. There's even an automatic needle threader so you don't have to try to get the thread through the eye of the needle at the end of the threading process. The drop-in bobbin system is easy to operate, and it's designed to eliminate frustrating thread jams that can be a problem in some machines. Winding the bobbin is easy too, with an automatic stop for a full bobbin and an override that prevents the needle from moving as you wind. This machine features an aluminum frame that is rigid and strong, ensuring everything stays properly aligned and hassle-free. The machine won't move around as you sew through heavy fabrics. A quick-start guide and included DVD will get you ready to start your first project in no time. At about $200, the price may be a bit on the high end for someone who isn't going to be doing a lot of sewing. There are cheaper machines out there if you'll be doing only occasional projects. If you're into simplicity and want a machine that just does the basics, the extra presser feet, fancy stitches, and high speed sewing ability may just be an annoyance. This machine doesn't include a quilting table, which means large quilting projects can be a bit awkward. Other machines do have this feature. According to Grandma Likes to Sew, this machine isn't ideal if you're planning to do a lot of heavy duty sewing projects; however, if you're going to use it occasionally for upholstery or jeans, it will be fine. With more than 7,000 positive consumer reviews and a rating of almost five stars, it's no wonder the Brother CS6000i is Amazon's top-selling sewing machine. It features 60 programmed stitches and seven automatic button holes, allowing you to tackle your first big project and then lots of things to come. A 25-year warranty ensures trouble-free operation, and seven included presser feet give you plenty of options. This machine retails for about $150. You can vary your sewing speed from super slow for tricky zippers and curves to 850 stitches per minute on long, straight seams. You can even use a button to control the speed, rather than the foot pedal. Threading is easy with numbered steps posted right on the machine. The process ends with an automatic needle threader to save your eyesight. The bobbin system is jam-resistant and allows for drop-in loading. There's a diagram printed on the machine to make it easy to wind the bobbin. If you're planning to get into quilting or will be doing larger projects, an oversized table helps control bulky or large fabric while you're working. Brother offers free phone support for as long as you own the machine, which means you can get your questions answered right away. The Brother CS6000i does not have a metal frame, which means it is lightweight and less stable than some other options. If you'll be doing a lot of heavy duty sewing, it may not be right for you. If you just want a simple, mechanical machine, the features offered by this model may be an annoyance. Some reviews on Amazon complain that this machine gave error codes after extensive use. If you're planning to do a ton of sewing, you may want to invest in a higher end model. There are also complaints from users about bobbin winding and jams. Brother has worked to fix this issue, but some users are still having the problem. 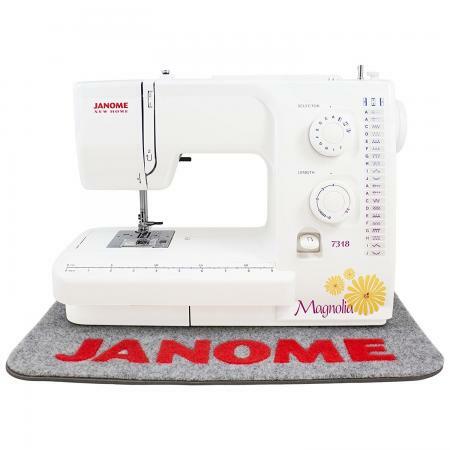 If you prefer a mechanical sewing machine without the complication of software and lots of elaborate stich patterns, the Janome Magnolia 7318 is a good choice. Great for beginners because of its simple operation and thoughtful design, this model is popular on Amazon, where hundreds of users have given it four and a half stars. With 18 stitch options and a four-step buttonhole, this machine will handle your basic sewing needs. It comes with several accessories, including four presser feet, and it retails for about $300. As a mechanical machine, there is no software to learn. You don't have to interface with a computer as you sew; simply push buttons and lift levers. The weight of this machine and its sturdy metal frame make it ideal for use with all fabrics, including heavyweight sewing. The drop-in bobbin system is simple to use and jam-proof, so you can easily load the bobbin and then forget it. Users report this machine is easy to thread, despite the fact that it doesn't have an automatic needle threader. With variable speed up to 830 stitches per minute, you can sew at your own pace. Because this is a mechanical machine, it only offers 18 stitches. If you want lots of options for decorative stitching, you should go with a different model. At about $300, this is on the more expensive side for a beginner machine. If you'll be using it for a long time, the investment may be worth it. Users on Amazon report this machine is quite loud. If you're looking for something you can operate quietly at night while everyone else is asleep, you may want to consider a different model. This is a heavy machine. At almost 17 pounds, it may not be easy for some users to set up and take down or to carry up and down stairs. 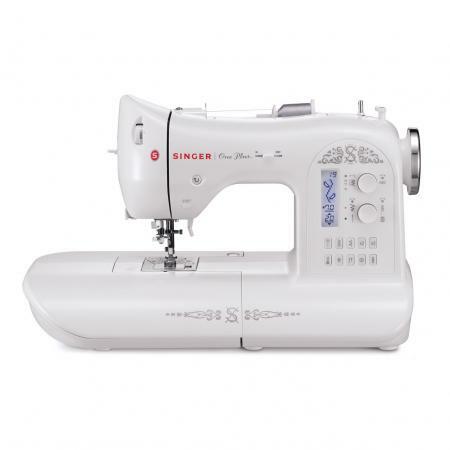 If you aren't on a tight budget and want to invest in a machine that will last for decades of regular sewing, consider the Singer One Plus. This computerized machine comes with 231 pre-programmed stitches, including six one-step button holes. You can use it for embroidery and quilting once you are ready, and it comes with five presser feet and several other accessories. It also has a 25-year warranty and won the Women's Choice Award twice. This model has an MSRP of about $500, but you can often find it for considerably less at stores like JoAnn Fabrics. This model has one-touch threading, which means you lay the thread in a groove and push a lever. The machine does the rest, including threading the needle. It has a drop-in bobbin feature, which is jam-proof. No need to fish around for the bobbin thread and make sure it's properly lined up. Winding the bobbin is easy as well. Sew at your ideal speed with variable speed control. When you want to get something done quickly, you can sew at up to 750 stitches per minute. Use a button to control speed if you prefer that to the foot pedal. With a heavy metal frame, a wide sewing space, and a presser foot that lifts extra high, this is an ideal option for those who plan to do heavyweight sewing or machine quilting. Because the user interface is easy to use, this machine is great for expanding your skills and getting good results. You can embellish any project with a monogram or machine embroidery that a traditional beginner machine would not allow. This is quite expensive for a starter sewing machine. If you won't use all the bells and whistles, it may make more sense to purchase something more affordable. If you're easily overwhelmed by fancy features, look elsewhere. While this model is easy to use, it has a lot of options. At more than 18 pounds, this isn't a light machine. That's great for quilting and heavy fabrics, but it's not good if you need to move it around a lot. According to Quilter's Review, this model has an LCD screen that can be challenging at times. You have to scroll through all the stitches to select the one you have in mind, which can be time-consuming. Start by thinking about how you'll use the machine. Consider how you'll use it in the next year and how you'll use it five years from now if you continue to learn. It makes sense to buy a machine with features that will grow with you, but you don't need a lot of extra features if you'll just be using it ever once in a while. Set a budget for yourself first and then look for a machine that represents a good value within that budget. Within your price range, you'll find a lot of variation in features. Think about how you interact with technology. Do you enjoy computers or avoid them? Do you like learning new systems and software? This will help you choose between a mechanical machine or a computerized one. Consider whether you are interested in quilting. If you are, choose a machine that has some quilting features you'll enjoy. Look for a heavy model with a wide sewing surface. Know if you'll need to move the machine a lot and how much you can comfortably lift. There's a lot of variation in machine weight. 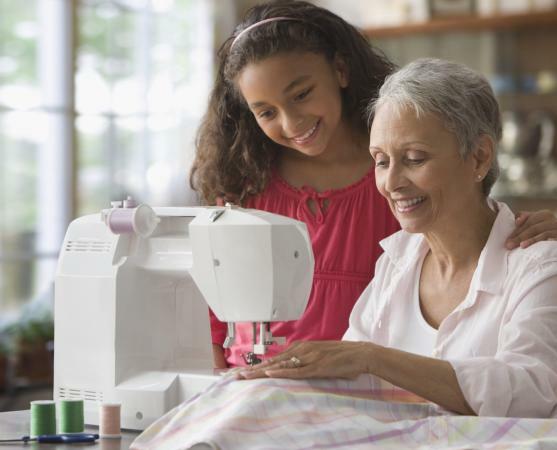 Buying a beginner sewing machine can seem intimidating, but there are some great models on the market that will help you learn quickly and grow in your abilities. Take some time to think about your needs and budget, and then get started sewing.